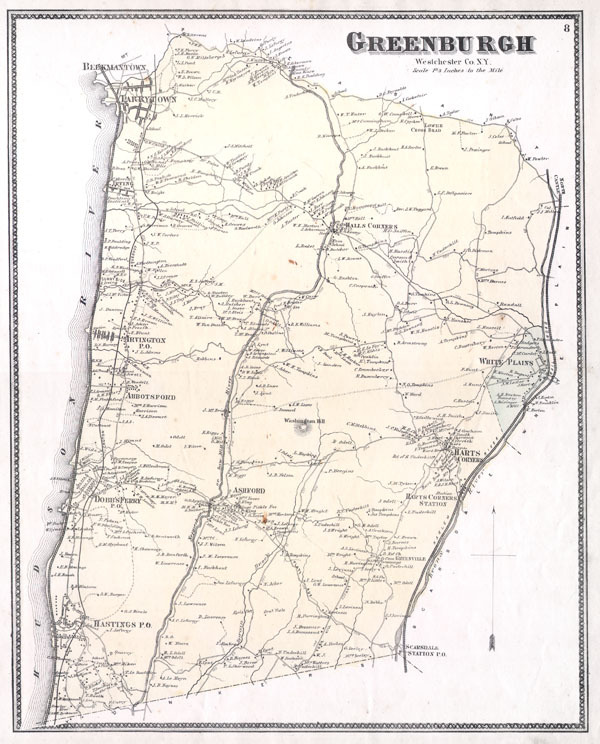 This is the scarce Greenburgh sheet from Beers' 1867 Atlas of Westchester County, New York. When this map was produced 'Greenburgh' consisted of what is today the central Westchester County. Includes White Plains, Scarsdale, Hastings, Dobbs Ferry, Abbotsford, Irvington, Irving, Hall's Corners, Ashford, and other communities between the Harlem River and the Hudson River. Indicates the Croton Aqueducts, the Saw Mill River, and the Sprain Brook. The extraordinary detail of this map, down to individual households with family names, make it a fascinating study for the family researcher or historian. Beers, F. W., Atlas of New York and Vicinity, 1867.